I am a big fan of Mexican food. The holy trinity of coriander, chilli and lime that is its cornerstone make so many ingredients sing. Take sweetcorn. Yes it’s sweet and juicy on its own but if you add the fire of a chilli, the freshness of lime then the oomph of coriander it really takes off. 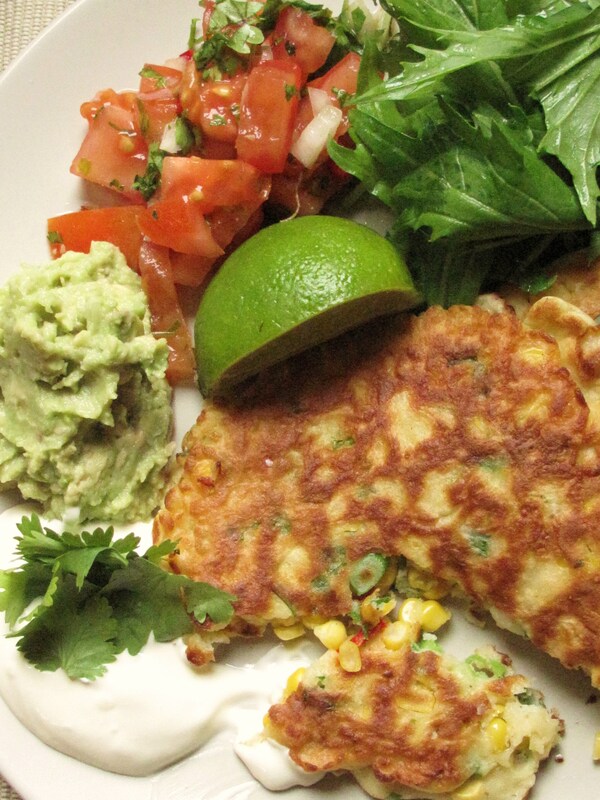 Last night I made fritters with this week’s corn on the cob and they went down a storm with everyone so much so that we’ve just polished off another batch this morning for brunch. There’s very little flour in this recipe, just enough to hold things together so you don’t get the doughiness you sometimes find with fritters. As well as chilli and coriander I added some of Marc Michel’s lovely scallions for a little extra bite. Fry them on the pan with a little oil then a spritz of lime and you’ve got a picky thing to have with beers or you can make up a quick salsa with this week’s tomatoes, maybe a little guacamole then serve on a bed of Marc Michel’s baby Asian salad leaves with dollop of sour cream and you’re sorted for brunch, lunch, a snack or starter. There is never a wrong time to eat this kind of thing. This is comfort food – summerstyle. While there are several elements to it, this is actually a very easy dish to put together. Prepare the salsa which involves nothing more than a bit of chopping and guacamole which you make by um …..mashing first, then the fritters take no more than10 minutes to pull together and you’re ready to go. Mash the avocado then mix in the onion. Season with salt and lime juice to taste. A trick is to leave the avocado stone in the dish buried in the guacamole to stop the avocado discolouring. 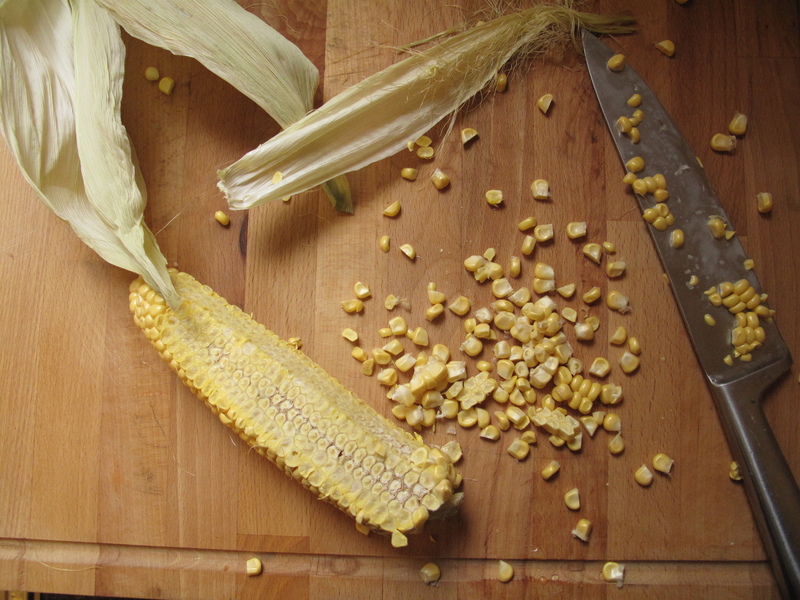 Begin by slicing the corn off the cob and set aside. Sift the flour and baking powder together then whisk with the egg and milk. Stir in the corn, scallions and chilli. Season with salt and pepper. Heat a little oil in the pan. Drop dessertspoonfuls of fritter mix onto the pan when the oil is hot (you’ll get between 4 and 6 fritters depending how generous your spoonfuls are). Fry on each side til golden (about 1 and half minutes each side) then take off the pan. Serve on a bed of salad leaves with the salsa, guacamole and some sour cream. Garnish with some coriander leaves. Brunch is served! The summer goodies keep on coming. This week it’s sugar snap peas from the Healys in Baltinglass. So fresh that you might just want to pod them and pop in them in your mouth. Be careful though – once you start it’s hard to stop. I admit quite few were demolished before I started cooking but I held onto a few and made a simple and very tasty bowl of pasta with mine. You really only need the time it takes to boil pasta for this one so have your bowls ready to go…. Heat a generous glug of olive oil in a pan. Add the onions and chilli and gently sautee until the onion has almost caramelized. While this going on you can shell the peas and I think you have to sit down and take a few minutes for this. It just feels weird to do it standing up and besides, the onion will take care of itself. Put on some music (it’s Alain Toussaint all the way here – very excited about his upcoming gig next Tuesday). When the peas are ready, stick on the pasta, set the table and maybe pour a glass of white if you haven’t already. Check on the onion, adding a little crushed Maldon. By the time the pasta is ready your onions are (hopefully) too. If not, just turn up the heat for a minute or two. At this stage I just add the peas in but if you have bigger or older ones you might want to drop them into boiling water for a few minutes first to soften them. Mine didn’t need that so in they went. Give everything a good stir adding plenty of black pepper and a little more salt if you think it needs it -remember that feta is a salty cheese so don’t go mad. Turn off the heat, add the drained pasta and feta. If the pasta seems dry drizzle with some of your best olive oil. Garnish with some torn basil leaves if you have them. If not, don’t worrry. Serve immediately. We’re coming to the end of our summer varieties . Courgettes are now officially thin on the ground, at least in Wicklow, as are Aubergines. I had such plans but we just didn’t get enough sun to feature them as often as I’d hoped. Tomatoes are also coming to an end, so to have them along with Basil is a last blast of summer (you know, the one we never had). Basil + Tomatoes can mean so many things – a simple salad (just add your best Olive Oil and a little Salt) or a more substantial salad if you add Mozzarella (this is the classic Caprese). 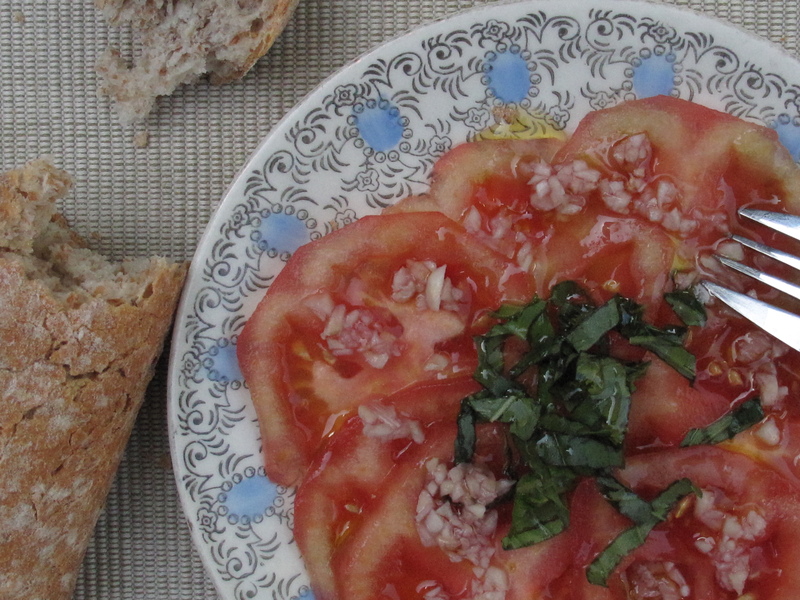 One of my first posts on this blog was Marcella Hazan’s simple Tomato salad. It still beats pretty much anything. 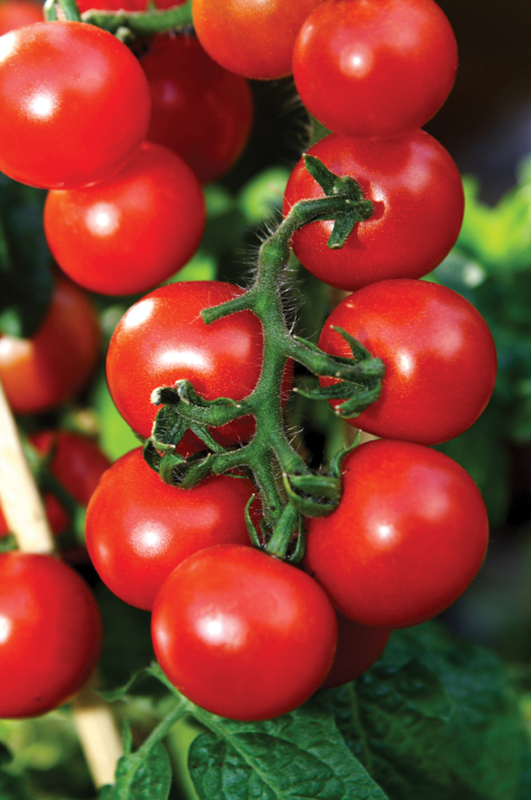 For an easy dinner chop up your Tomatoes and briskly fry them in hot Olive Oil with some Garlic and a little of the Chilli that’s packed in the paper bag along with the Tomatoes, then toss with Pasta, Basil Leaves and maybe some Black Olives. It’s a dish that takes all of 10 minutes to put together. These days I favour Pecorino over Parmesan with pasta. I bought a big block on a whim a while back and using it has reminded me of why it works so well. It’s a saltier cheese, with Tomatoes this works well as they tend to be sweet (or should be).It’s all about contrast which sounds a bit cheffy but is true. As there’s Basil in this week’s bag I’ll give a pesto recipe. I know, it’s a bit obvious but properly made it’s really really good and nothing like the stuff you buy in jars (even the fancier brands are muck). Good pesto has plenty of Garlic, real Pine nuts and ideally, Pecorino Cheese rather than Parmesan but you can use Parmesan if you’re stuck. It might seem a waste but using decent Olive Oil pays dividends as it adds so much to the flavour. Best of all, Pesto takes all of ,oh, 2 minutes to make, a quality I really rate in a recipe especially when it’s Culture night and the weather is good! Peel and roughly chop 2 fat cloves of Garlic and put in your blender along with 8 Tablespoons of Olive Oil (a generous glug), 2 Tablespoons Pine nuts, a generous pinch of Salt, and your Basil Leaves (remove any really thick stems first). Blast until everything is blended. A little chunkiness can be nice but you may prefer a smoother Pesto so you decide when to stop blending. 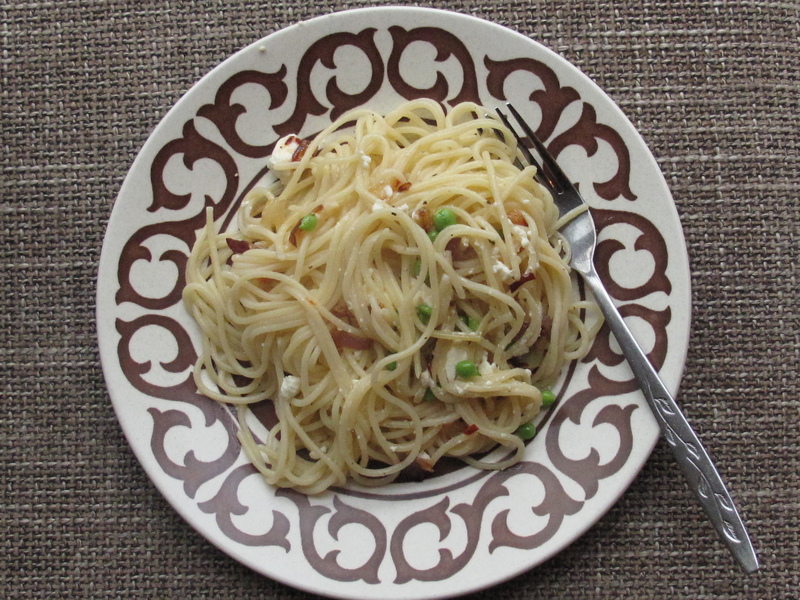 When you’re finished, stir in 2-3 tablespoons freshly grated Pecorino Cheese. Serve with freshly cooked Pasta and more grated Pecorino (or Parmesan).